← Britain growing and exporting tea? India: the world’s second-largest producer of tea. Our third stop on the tasting tour explored the world of Indian estate teas, focusing on three large and well-known tea regions in the country: Darjeeling, Assam, and Nilgiri. Red Lodge Books & Tea imports directly from estates in Darjeeling and Assam. We compared single-source estate teas (think single-malt Scotch) from Glenburn, Khongea, and Tiger Hill estates to a blended 2nd-flush Darjeeling using tea from Marybong, Lingia, and Chamong estates. As I mentioned above, India is the 2nd largest producer of tea in the world, but 70% of their tea is consumed domestically, so they don’t play as big a role in the export market as countries like Kenya. Darjeeling is the northernmost district in North Bengal. Of the 1,842,000 people who live there, over 52,000 make their living through tea. Darjeeling tea, often called the Champagne of Teas, is made from Camellia sinensis var. sinensis, the Chinese varietal of the tea plant, unlike tea from most of the rest of India, which is made from their native Camellia sinensis var. assamica. Despite the generalization that black tea is always 100% oxidized (often incorrectly called “fermented”), most Darjeeling black teas are, like oolongs, not completely oxidized. While Darjeeling is known mostly for its black tea, there are oolongs and green teas produced there. To be called “Darjeeling,” the tea must be produced at one of the 87 tea gardens (estates) in the Darjeeling district. Alas, the majority of tea sold with that name is not actually Darjeeling. Each year, the district produces about 10,000 tonnes of tea, and 40,000 tonnes show up for sale on the global market. In other words, 3/4 of the “Darjeeling” tea in the stores isn’t Darjeeling! That’s why we choose reputable suppliers at our store, buying most of it directly from the estate. Darjeeling tea changes dramatically by the picking season, which is why we chose three different black Darjeelings for this tasting. 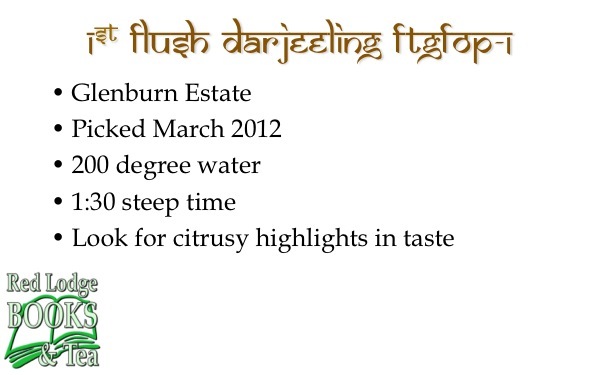 The first tea we tasted was a first-flush Darjeeling from the Glenburn Estate, where we get most of our Darjeeling teas. Glenburn was started by a Scottish tea company in 1859, but has now been in the Prakash family for four generations. The estate is 1,875 acres (with 700 under tea), and produces 275,000 pounds of tea per year. They are located at 3,200 feet altitude and get 64-79 inches of rain per year. Glenburn employs 893 permanent workers, plus temporary workers during the picking season. 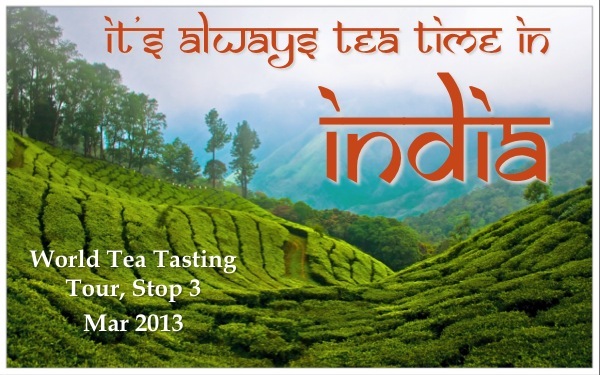 Our next tea was an organic 2nd flush blend by Rishi, using Darjeeling teas from Marybong, Lingia & Chamong Estates. It was specifically blended to bring out the characteristic “muscatel” flavor and aroma associated with second-flush Darjeelings. 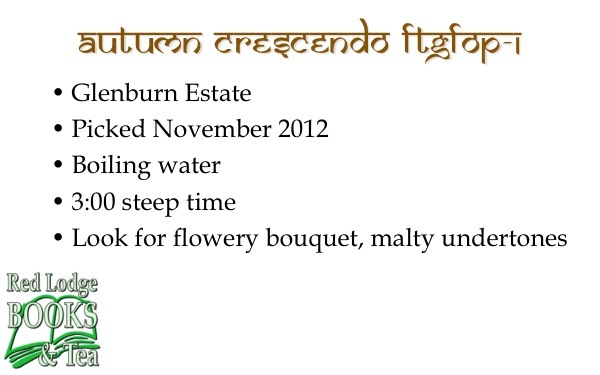 For the third tea, we went back to Glenburn and selected an autumn-picked tea. Unlike the first two, we steeped this using full boiling water for three minutes, bringing out the undertones one might otherwise miss. 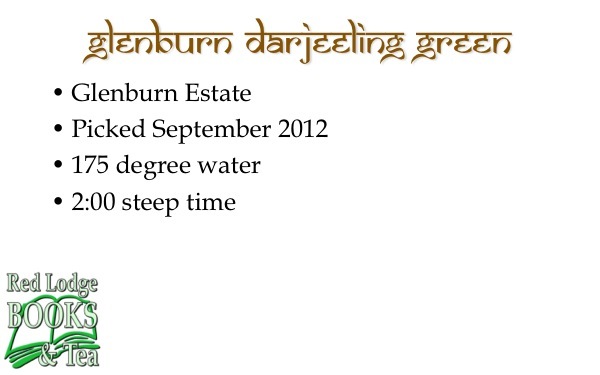 To wrap up the Darjeeling teas, we tasted a green Darjeeling from last fall. It’s an interesting hybrid of Chinese varietal and processing methodology blended with Indian terroir. Assam is a state in northeast India with a population of over 31 million and an area of over 30,000 square miles. If Darjeeling is the champagne of tea, then Assam would be the single malt Scotch of tea. Hearty and malty, this lowland-grown tea comes from the assamica varietal of the tea plant. The Assam tea that we tasted is from the Khongea Estate, which has 1,200 acres of land with 1,100 of that under tea. Sitting at 300 feet altitude, the estate gets 150-200 inches of rain per year, making drainage very important. They employ 1,202 permanent workers (again, more during picking), and produce 2,640 pounds of tea per year. Since Assam tea is frequently used in breakfast blends, we tasted this one with nothing added and then with milk, as most English tea drinkers (and many Indian tea drinkers) prefer. Nilgiri is the westernmost district of the state of Tamil Natu. It is smaller (950 square miles) and less populated (735,000 people) than Darjeeling, and quite high elevation, with tea growing between 6,500 and 8,500 feet altitude. 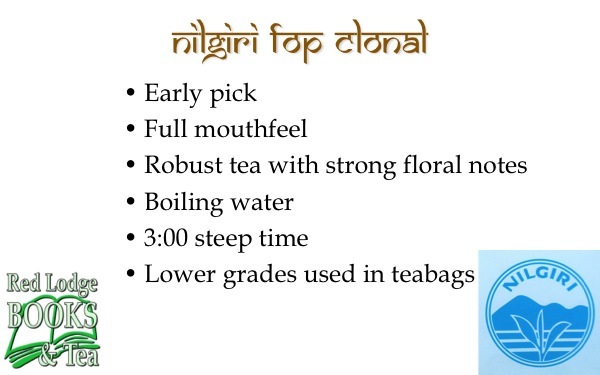 The tea that we chose from Nilgiri comes from the Tiger Hill Estate in the Nilgiris (the “Blue Mountains” for which the district is named). They have 640 acres under cultivation, almost all of which is “clonal,” meaning that it was grafted onto other rootstock from a few mother plants. Tiger Hill has been producing tea since 1971. This was the third stop on our World Tea Tasting Tour, in which we explore the tea of China, India, Japan, Taiwan, England, South Africa, Kenya, and Argentina. Each class costs $5.00, which includes the tea tasting itself and a $5.00 off coupon that can be used that night for any tea, teaware, or tea-related books that we sell. Posted on 18 March 2013, in Styles & Blends and tagged Assam, black tea, breakfast tea, camellia sinensis var assamica, camellia sinensis var sinensis, Chamong Estate, Darjeeling, Glenburn Estate, India, Khongea Estate, Lingia Estate, Marybong Estate, milk, Nilgiri, Tiger Hill Estate. Bookmark the permalink. 3 Comments. Hi, your site looks great to me as a tea lover. I wonder if you have anything that you can tell us about how to be sure what we are getting is darjeeling? The obvious is as you said to buy from reputable source and reputable gardens, anything else you might add is very appreciated, especially which sites I might trust to purchase from. thank you very much. It’s difficult, Richard. If you plant those same cultivars in the mountainous regions surrounding Darjeeling, or in similar environments in the Himalayas, my palate certainly isn’t good enough to distinguish them. I suppose to some extent if you can’t tell the difference it doesn’t matter, but I like to know what I’m drinking. I’d just pick a local tea shop that you like and trust and discuss it with them. thanks for your reply, Gary. I do trust the site strandtea.com as I have talked several times with the owner. so, I like to buy there but I will also buy from gardens that are forrest alliance certified. take care, wish i could visit your shop but dont get out there.